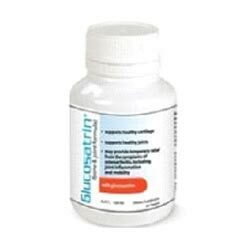 Glucosatrin Review – Is This Product Safe To Use? Joint pain can be a problem at any age although it does often affect those with certain conditions such as arthritis or rheumatism and people in their senior years. There are many products on the market that claim to help relieve the pain associated with damaged and aching joints such as Glucosatrin which is made by the company Market America. Glucosatrin is marketed through the company’s official website which is user-friendly and reasonably informative. While some areas are lacking, for example there are no customer testimonials, the site does show clinical test results which proves how effective Glucosatrin can be when used on a regular basis. The manufacturer of Glucosatrin has a 30-day money back guarantee and the cost of the product is $44.95 which is slightly higher than many other competitive brands. What are the Ingredients Used in Glucosatrin? The ingredient information for Glucosatrin is fairly complete and the full list of active substances is provided. The key ingredient is Glucosamine which is a very commonly used in this type of product as it helps repair already damaged cartilage and rebuild stronger joints to prevent future damage. Glucosamine has been tested in clinical trials and proved effective in many areas of joint pain relief. Other ingredients in the formula include Vitamin C to help grow healthy tissue, Manganese to fight weak joints and Vitamin D3 that encourages the absorption of calcium. In addition to all the above, Glucosatrin is also said help reduce inflammation which in turn improves flexibility and range of motion. Glucosatrin should not cause harmful side effects although it cannot be taken by anyone with shellfish allergies due to the inclusion of the fish-derived Glucosamine. What are the Pros of Glucosatrin? What are the Cons of Glucosatrin? Glucosatrin seems to be a reputable brand and the manufacturer supplies a good amount of information about the product on a professional website. It is unfortunate that the formula does not contain Chondroitin as it always works well when used in conjunction with Glucosamine, although judging from the test results the overall formula should have positive effects on painful joints and damaged cartilage.